Often one of the first wireless attacks a hacker will learn, WEP networks in your area can be tracked down with only a few software tools and cracked with a network adapter supporting packet injection. While WEP cracking has always been relatively straightforward, the simplicity with which it can be found and broken in 2018 brings it firmly into the abilities of even the most novice of hackers. While still much more rare to see than open or WPA-encrypted networks, the evolution of tools like Wigle Wifi allows anyone with an Android phone to identify WEP networks for themselves simply by walking or driving by one. Even easier than doing this in person is to simply look at online wardriving databases which clearly show the location of these networks. Thanks to years of wardriving data, Wigle.net tracks statistics about the type of encryption used with any detected Wi-Fi networks uses. Over time, the percentage of Wi-Fi networks using WEP has dwindled from 45% to a stubborn 7.45 percent. WEP, or Wired Equivalent Privacy, was implemented in 1995 to provide the same expectation of privacy as on wired networks for users of Wi-Fi but had security problems that came to light shortly after. It was deprecated in 2004, superseded by the WPA and WPA2 encryption that you see today. The reason for this was a series of increasingly devastating attacks against the encryption used in WEP, resulting in the ability to recover the password in a matter of minutes. WEP is a stream cipher which relies on never using the same key twice to provide security. Unfortunately, as demonstrated in several published attacks, an attacker is easily able to force the same key to be used twice by replaying network traffic in a way that forces a tremendous amount of packets to be generated. This allows an attacker to collect the data needed to determine the encryption key and crack the network password outright. With good range and a powerful network adapter, anyone can expect to crack WEP networks in only a few minutes. The power behind WEP hacking comes from two different parts of the attack: the ability to stimulate traffic even from a busy network and the ability to crack the network password when collecting a certain amount of that traffic. Remember that with WPA, hackers can't even capture a handshake from an empty network, but even an empty WEP network can be attacked with packet injection. In an incident in May of 2006, WEP networks left connected to the credit card processing terminals in TJ Maxx stores allowed a hacker to access the credit card data of millions of customers in one of the biggest ever data breachs. This dramatic example underscored the fact that WEP networks are a critical security risk anywhere they are used. Today, WEP serves two major functions in the hacking world: being an easy target and being a trap for script kiddies. Because WEP hacking is often the first criminal hackers learn too, it's often entertaining to set up a honeypot to catch local script kiddies trying to break in. In spite of the popularity of WEP honeypots, you'll find plenty of legitimate vulnerable networks nearby. In general, everyone should treat these as highly suspicious, since it's unlikely that only one person has tried to break into the network. To find nearby WEP networks, one can simply go to Wigle.net and sign up for a free account. Next, they would click "Advanced Search" and run a search for networks with WEP security near their location. In my example below, I chose to limit my search to only networks I'd seen with my phone personally. Searching my personal database for nearby WEP networks found several pages of results. In a dense area, one could simply drive around with the Wigle Wifi Android app, upload the files to Wigle, then run this search. This will reveal the location on a map of every WEP network that was passed. The results can be surprising! 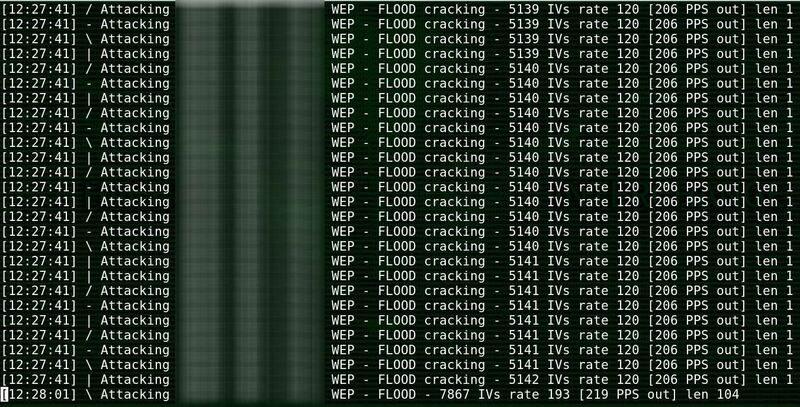 As I previously stated, WEP is extremely simple to crack. Just because it's easy doesn't mean it's legal, so make sure that you have permission to do this to any network you're practicing on before launching this kind of attack. While it's very likely the attack will succeed, and it's good to know this skill, the risk that the network you are attacking is a honeypot is much higher than the average encrypted network. WEP is fundamentally broken, so very few people will choose to use it. To crack a WEP network, you'll need to be able to stimulate enough network traffic to cryptographically attack the key. The best way to do this is to use a wireless network adapter that's capable of packet injection. This means our adapter will be able to send forged packets to our target network, allowing us to replay anything that would cause the router to provide the amount of traffic we need. We've tested several Panda Wireless network adapters like the PAU06 and PAU09, and found them to work well for packet injection with Kali Linux. We have a list of the best compatible network adapters available for Kali in the article linked below if you need some help selecting one. You'll also need a fully updated version of Kali Linux, which you can run as a virtual machine or directly on something like a Raspberry Pi. To start attacking a WEP network, you'll need to find one first. 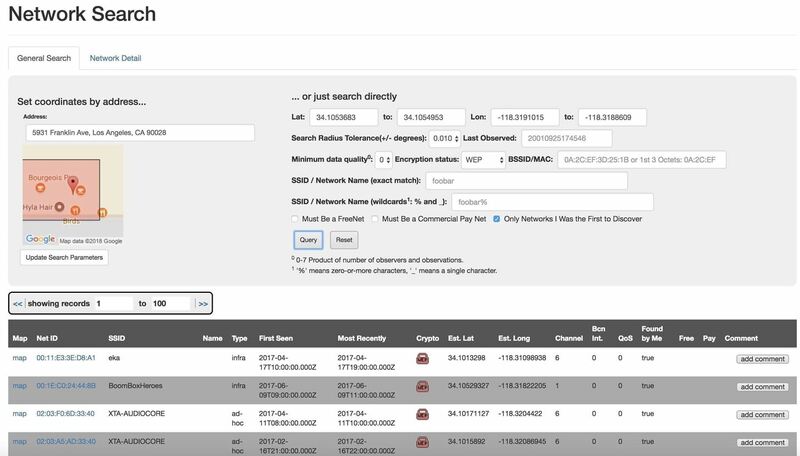 To do so, you'll run a series of filters with Airodump-ng to help you locate only vulnerable networks nearby. Airodump-ng is included in the Aircrack-ng package, so be sure to install it with apt-get install aircrack-ng if you don't already. To get started, type ifconfig to find the name of your wireless network adapter, which you should have plugged in already. In Kali Linux, it should be something like wlan0. Next, you'll need to put your attack card into monitor mode. In a terminal window, type sudo airmon-ng start wlan0. This will put your card into monitor mode, likely changing the name of the card as well. Take note of this new name by running ifconfig or ip a again, as you'll need it for the next step. Next, run Airodump-ng with the filter --encrypt WEP to see only WEP networks nearby. The complete command can be seen below. This will scan the area for any packets using WEP encryption, returning the name and information of the network if one exists. Once you have the information, you'll need to use it as a filter to tailor your attack in the next step. Once you have the information you need for targeting the WEP network from Airodump-ng, there are a few variables you'll need to remember. First, take note of the channel number, and second, copy the BSSID (or MAC address) of the network. The next tool you're going to use is a little aggressive, to say the least. Besside-ng will attack all Wi-Fi networks nearby if you don't give it the proper attack parameters to prevent this behavior. The actual attack, however, is highly automated and should proceed until the attack is successful in recovering the WEP network key for as long as you are in the range of the network. To launch the attack, type the following into a terminal window, swapping out the appropriate information. So, if your network card was wlan0mon, the BSSID of your target network was 7C:CA:ED:A4:9B:EE, and the target network was on channel 3, your command would look like the following. Run this command, and the attack will launch against the network. If your card has trouble or you see "network is down," you can run airmon-ng check kill to kill any processes that may be taking your network adapter out of monitor mode. While the attack proceeds, Besside-ng will log all of the data it collects in a .cap file for later retrieval. If you experience any problems with Besside-ng or get disconnected, don't worry! You can run Aircrack-ng on the .cap file as you add more data generated by Besside-ng, and all of your collected IVs (initialization vectors) will be there. This means you can come back to the same place at different times and gather more IVs to your .cap file until you can crack them to derive the password by running Aircrack-ng. To try to crack the WEP network for the information you've gathered, you'll need to call Aircrack-ng with the location of the .cap file as the argument. This is pretty easy since Besside-ng usually stores WEP.cap in the root folder. That means running the command to try cracking the network is usually as seen below. This will read the .cap file and allow you to select which network you want to crack from the ones Besside-ng has encountered. If you have saved up enough IVs, you can crack the password outright, or you can leave it running while Besside-ng runs, and the attack will be repeated automatically every 5,000 IVs until it succeeds. After some number crunching, you should see the WEP key cracked in a few seconds to a minute, depending on whether you have gathered enough information. Unless you are trying to catch local script kiddies in the act, there is no reason to use WEP encryption for anything. Aside from being insecure, it also makes your system a very visible target. You should scan for WEP networks in your home and work using Kismet or the Wigle Wifi app, and replace or upgrade any devices that are still using this broken standard of encryption. There you have it, it only takes a few minutes to break into a WEP network using modern tools like Airodump-ng and Besside-ng in conjunction with an appropriate wireless network adapter. Since WEP cracking is a staple of Wi-Fi hacking, I wanted to be sure we covered it in our intro to Wi-Fi hacking series. Hopefully, you have an understanding of what WEP is, why it's vulnerable, and how to go about actually cracking it. I hope you enjoyed this guide to hacking WEP Wi-Fi networks! If you have any questions about this tutorial or WEP cracking, feel free to leave a comment or reach me on Twitter @KodyKinzie. We'll be doing more in our Wi-Fi hacking series, so stay tuned.